We can conquer careers, earn advanced degrees and reasonable livings, scale mountains, win tennis matches and softball games. We've come a long way--so why do some of us have such a hard time in the realm of love and romance? 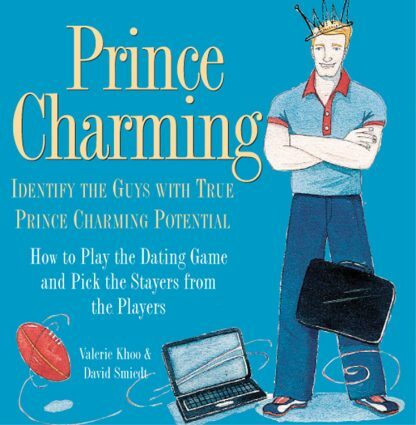 Prince Charming won't solve all problems, but it will go a long way. This charming, illustrated book is every girl's guide to finding the right guy and keeping the relationship exciting once you've found him. But, first off, our authors--one a guy and one a gal say, "Relax." They caution we shouldn't be in such a hurry to tie the knot. Enjoy the process if you can. Nurture your own self-esteem. Explore your own needs. Banish bad attitudes. Trust your intuition. Valerie & David tell it like it is: if the new guy seems too good to be true he probably is. If he's so boring you're yawning on the first date, you'll be asleep by the second. He may be a Stayer, but Stayers with a little Player in their blood make for more fun. There are lists of what to look for and what NOT. And plenty of advice on separating the keepers and how to throw the others back. Not to mention a glossary of Male-Speak, what he says, what he really means, especially when he says he can't say "I'm sorry."